In the weeks before Thanksgiving, Project MANA helps hundreds of local families have a happy, healthy Thanksgiving through its annual Let’s Talk Turkey Food Distribution. 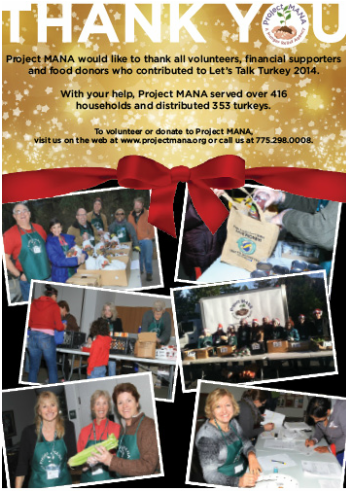 With the help of dozens of social service agencies, schools and churches throughout North Lake Tahoe and Truckee, Project MANA works to identify as many community members as possible who need assistance by providing a hearty Thanksgiving meal for their families. To find out if you qualify, call us at 775-298-4161. For just $50.00 you can sponsor a local family’s Thanksgiving meal! Donate here.